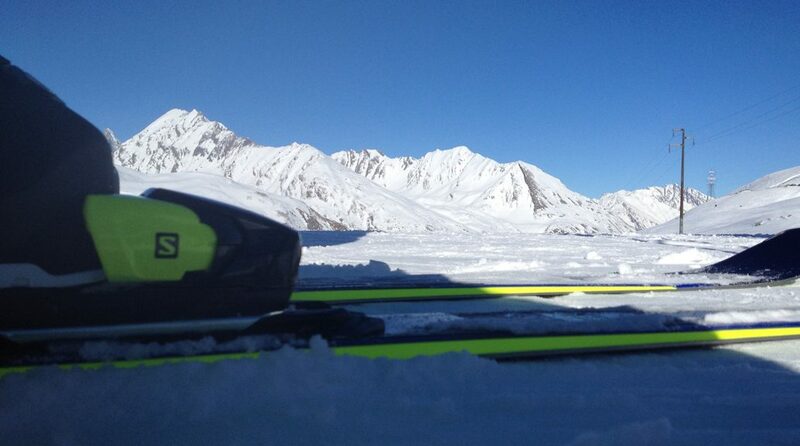 Truly one of the best skis, wherever the mountain takes you, the Rossignol Soul 7HD. Although the Soul 7, with its 106mm waist, suggests its a big mountain ski; it is just as easy to ski on the piste as 85mm underfoot piste ski! Taking the Soul 7’s away after two seasons out of skiing, and being use to a 85mm underfoot all mountain ski, it was safe to say that, even as a 23 year old confident chap, I thought I might of bitten off more than I can chew. In my previous years skiing before my short break I would ski all of the mountain comfortably; including the odd hike to find some of the fresh snow in the untouched couloirs of the French/Italian Alps. Wanting to further my backcountry skiing the Rossignol Soul 7HD skis were highly recommended to me. The first day of my ski holiday came with the perfect conditions, lots of fresh snow, to throw me in the deep end with the new skis; the phrase ‘baptism by fire’ comes to mind. Although we are suggesting ‘fire’, myself and the Soul 7’s were in ‘heaven’. Instantly feeling so comfortable in the powder, strange noises of whoops of enjoyment were a regular occurrence. 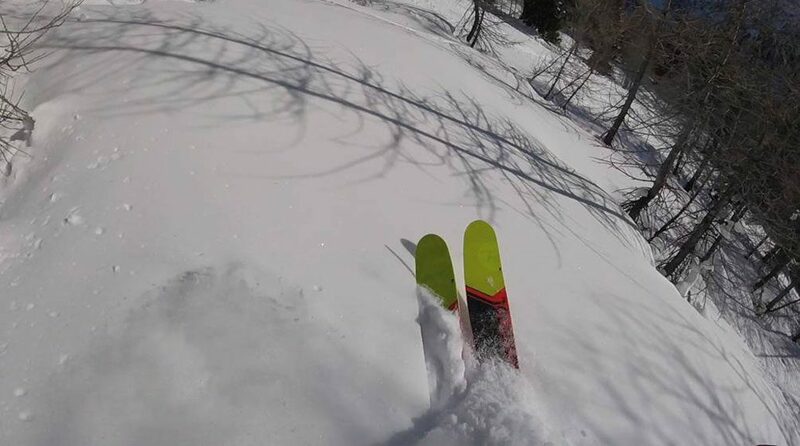 After each run through the trees or open couloirs I felt like my skiing had improved massively. The acknowledgement from my brother, a better powder skier than me (although I would never tell him), confirmed my thoughts. 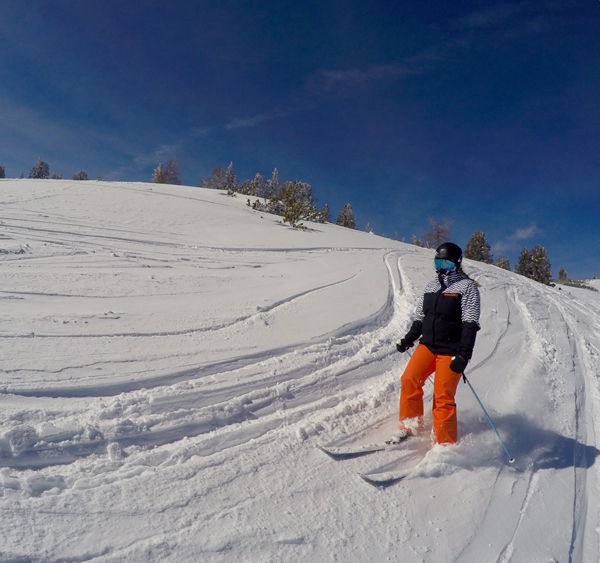 The family joke of ‘directional charging’ became much more of a reality as we were lapping the off piste sections. As the week progressed unfortunately no more fresh snow was to come, no fresh powder but perfect corduroy piste with sunny conditions. This would be the real test on the hard pack piste with a 106mm waist. Again the Soul 7’s were unbelievably good. Carving made easy and edge hold with no chatter at all. Safe to say that I was highly impressed by the complete versatility of this ski. Towards the end of the week the snow became more hard pack, with some runs featuring ice patches. 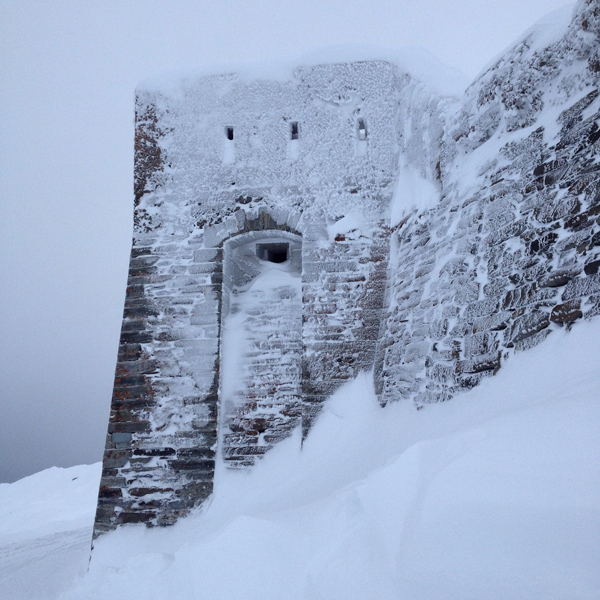 The best snow conditions were on the relatively untouched black runs which would prove to be the best test for the skis. 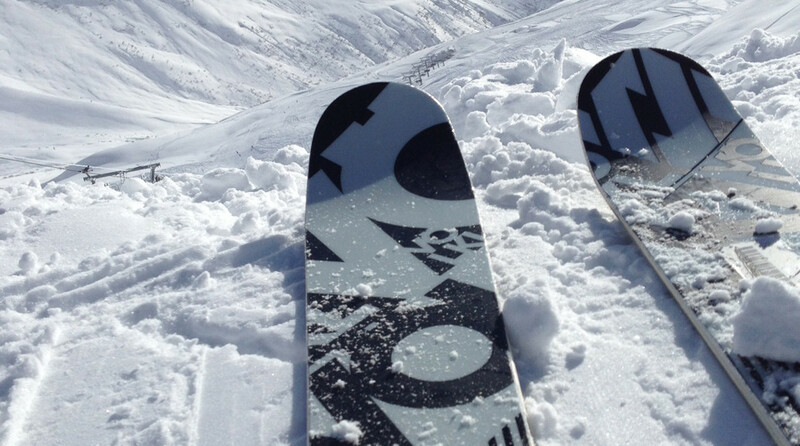 The Soul 7’s is as easy to ski in the deep powder, and steep black runs, as it is on those leisurely blues and reds. The Soul 7’s is as easy to ski in the deep powder, and steep black runs, as it is on those leisurely blues and reds. Therefore, for the advanced skier who wants to ski everything from deep powder to corduroy piste, with one ski, the Soul 7HD is the ski for you. 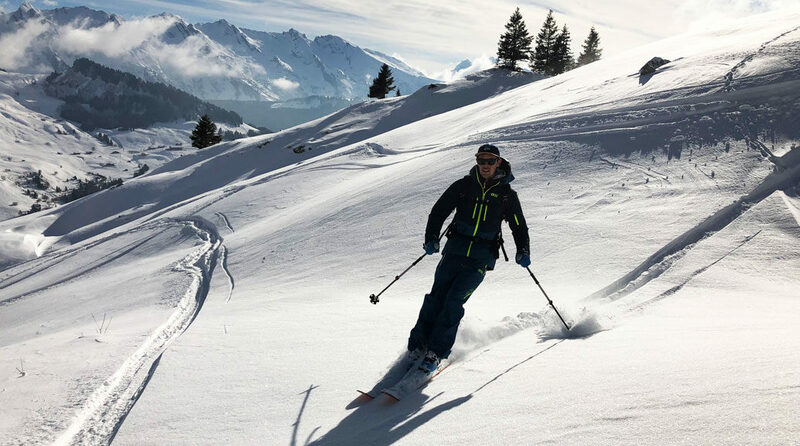 But also for the more advanced intermediate who wants to get more into the big mountain skiing this is a great ski that makes life easier in all conditions. Salomon are replacing the X-Drive range of skis with the new range of Salomon XDR skis, next season, and let me tell you – its more than just a name change! There will no doubt be plenty of articles explaining the technical merits of these skis; from the Snowsport Industries Great Britain (SIGB) Ski Test in March. This annual event is open to suppliers, retailers and the media; and provides them with an opportunity to thoroughly test next season’s skis. This year it’s in Kühtai, Austria. They will no doubt explain the benefits of the full wood core, the single titanium laminate, the power zone, and the all terrain rocker – to name a few – and how these XDR skis meet Salomon’s desire to produce a ski that, in resort (or frontside as they like to call it) will handle a variety of snow conditions, such as carving groomed pistes, powering through crud or floating on fresh powder. What I will say, “there isn’t an emoji with a big enough grin to express how much fun these skis are to ski”! I’m not going to explain the all mountain C/FX Shape; I’m going to say these are the best skis I have ever skied on; they are the skis for me! So who am I? 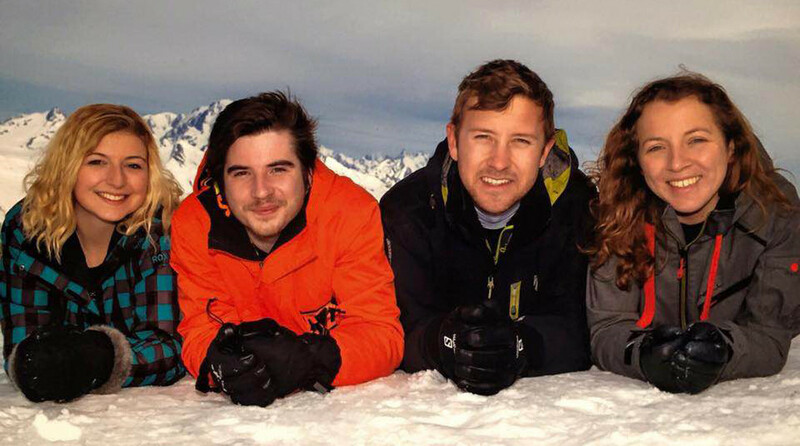 I’m the average recreational skier, who once a year travels to the mountains (Alps) to ski for six days. 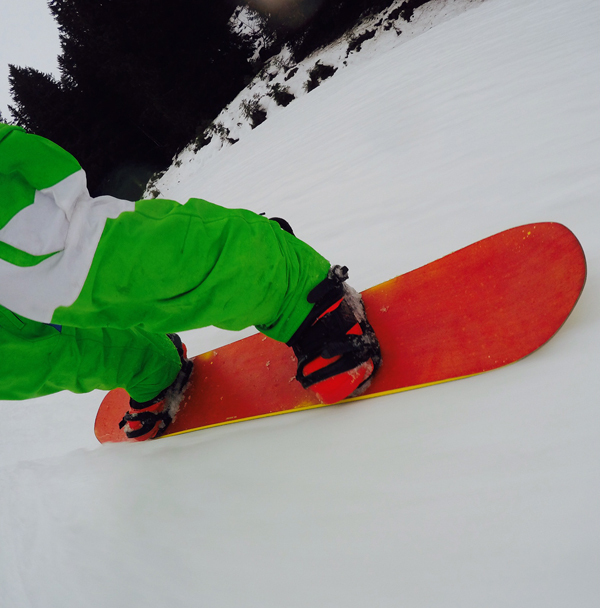 I like to ski on piste, and I’m extremely comfortable on red runs. I’m sure that ‘technically’ I could improve, but I’m on holiday, and my main focus is to have fun skiing in the mountains! 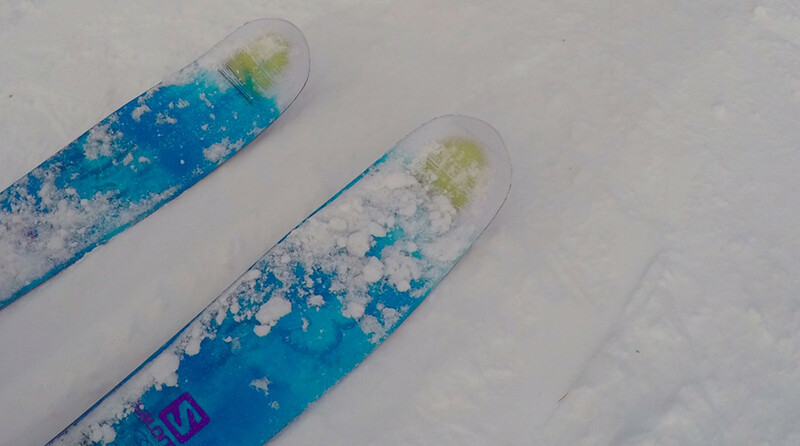 I’m on the first lift and will ski all-day; so the ease with which I skied these skis, made them all the more delightful – and they look good too! I even ventured off-piste! Well a little area of ‘powder’ between the runs. These skis took me where I wanted to go, on large carving turn, with excellent edge hold; even on the few ‘black’ runs these skis gave me the confidence to attack. The faster I went the more stable and confident I felt. I was having fun, run after run, and thanks to the lightweight construction I could – all day long! I even ventured off-piste! Well a little area of ‘powder’ between the runs. I was awful, but the skis gave me plenty of float as I manoeuvred myself back to the haven of the neighbouring run. 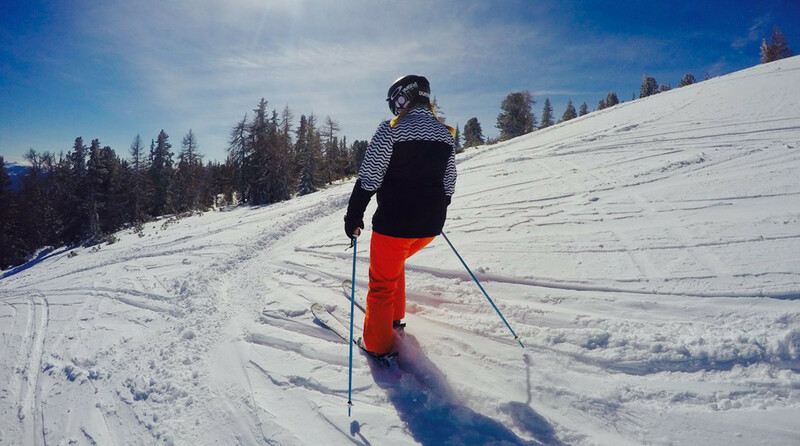 I tried it a few times, and marginally improved, however it only reinforced my love of the groomed ‘corduroy’ pistes – which is where I stayed! 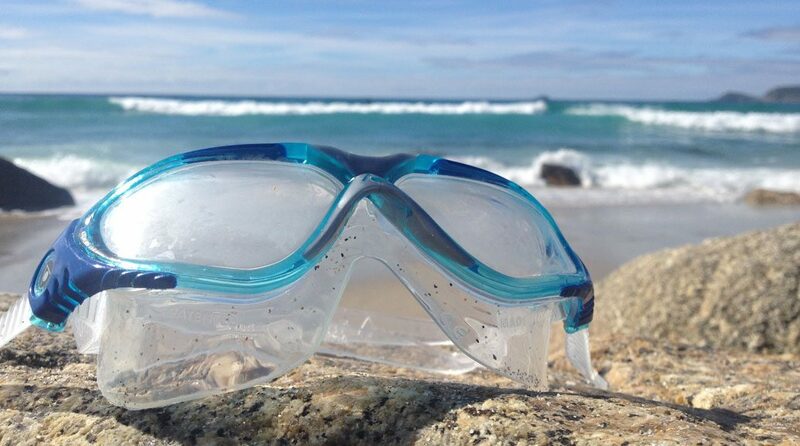 As a recreational open water swimmer, I dived in at the chance to see what the Aqua Sphere Vista Swim Goggles were like. I was off to Cornwall for a week, and therefore thought the Atlantic was a suitable piece of open water in which to test them! Firstly, I have to say, the goggle case is excellent. It’s a hard plastic, goggle shaped case which protects the goggles – so even if you are the sort to chuck them into the bottom of your kit bag the goggles are protected! The goggles, themselves, have a large sealing skirt around the lenses; which I assume is inherited from their sister company’s diving history. The skirt is extremely comfortable and produces a very effective seal; with no leakage. The strap adjustment is simplicity itself, thanks to Aqua Sphere’s Quick-Fit™ one-touch adjustment. The button allows you to easy extend strap, and once in place, the strap can be tightened; with a reassuring click. If over tightened a simple press of the button releases the strap; a click at a time if your quick! 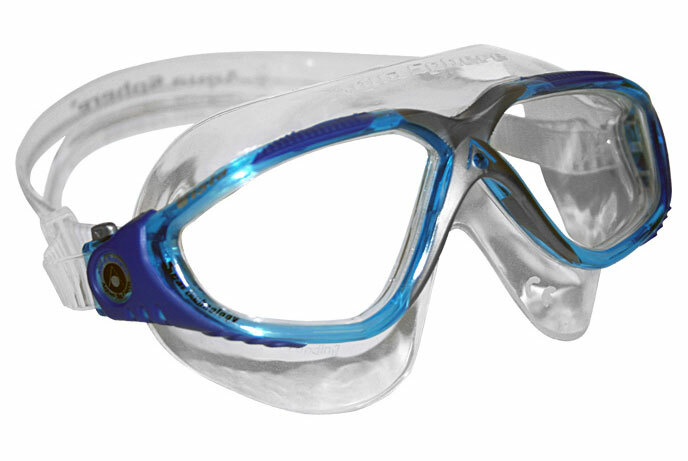 So if you looking for some open water swim goggles; I recommend trying Aqua Sphere’s Vista Swim Goggles! In the water the visibility was excellent (I had clear lenses), as expected from Aqua Sphere’s ‘Wraparound’ 180-degree visibility design. I had no issues with fogging whilst I was in the water, which was about 30 minutes, thanks to the anti-fog coating. The durable polycarbonate lenses have a scratch resistant coating, too, and over the week the lenses stayed clear. They also provide 100% UVA & UVB protection. As for drag, there is plenty of other aspects of my swimming that need attention before claiming: “my goggles are slowing me down”, so no comment! So what are the new Oakley Moonlighter sunglasses like? I had the good fortune to try a pair, with Frost frame and Sapphire Iridium lenses. 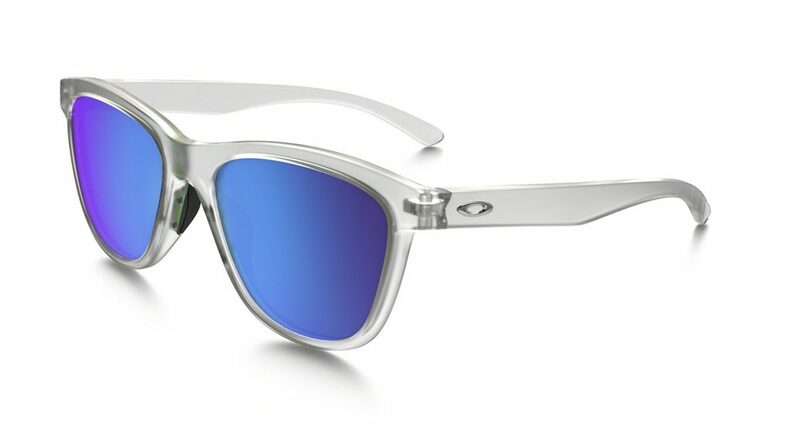 The Moonlighter’s are a perfect mix of the retro late 80s style, with modern Oakley technology. The frosted frames are not only a cute colour combo with the sapphire coloured lenses, but they are incredibly durable and lightweight due to their stress-resistant O Matter frame material. Comfort and performance is important to Oakley, so they have a unique Three-Point Fit design that holds lenses in precise optical alignment, while their Unobtanium nose pads ensure a snug, and secure fit. The Sapphire Iridium lens add a cute and bright ‘pop’ of colour to your day, at the same time they protect your eyes from UVs with Plutonite lens material, which filters out 100% of UVA/UVB/UVC & harmful blue light up to 400nm. And, like all Oakley eyewear The Moonlighters include High Definition Optics (HDO) which is a collection of patented technologies that allow Oakley eyewear to meet or exceed the testing standards of the American National Standards Institute for optical clarity, visual fidelity, and impact resistance. So if you know your face dimensions, you’ll know if they fit. Or you can pop in-store and try them on! The more I wore them (and cheekily checked out my reflection) the more I liked them. They fit comfortably on my face, and they certainly made things clearer and reduced the glare/sun strike on our artificial slope. I think the only negative I have about the Frost Sapphire Iridium Moonlighters is that the lenses are not polarized, however, other styles have polarised lenses. Apart from that, I think these shades are pretty neat. And, if you’re someone who wants trend and functionality out of a pair of sunglasses, I would highly recommend you try these out! I mean, they’re cute, lightweight and durable… What more could you want? The Les Arc 1800 resort is located on the outer edge of the Vanoise National Park which forms part of the Italian border around 10-12 hours drive from Calais or a 3 hour transfer from Geneva Airport. 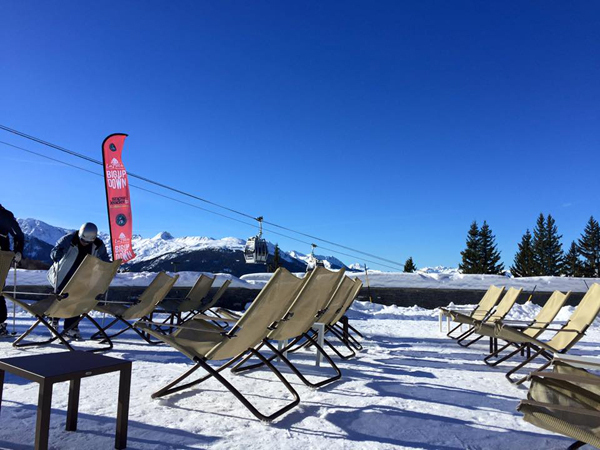 The resort is linked with La Plagne and Peisey-Vallandry creating one of the largest skiing areas in the world called ‘Paradiski’ and boasts 425km of pistes; ranging from easy relaxing blues to challenging blacks. What a view! 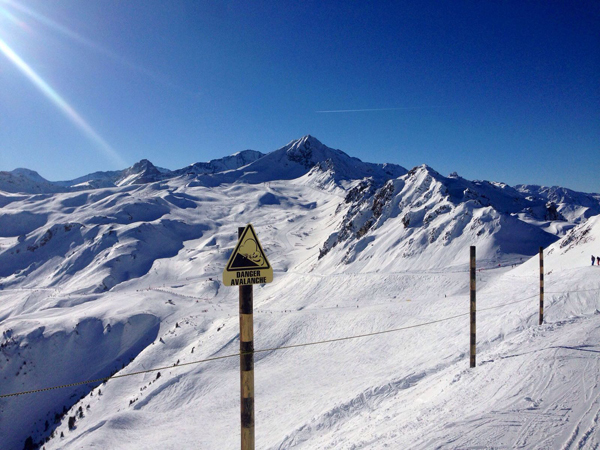 425km of pistes; ranging from easy relaxing blues to challenging blacks. Les Arc itself is made up of four smaller resorts Arc 1600, Arc 1800, Arc 1950 and Arc 2000 with its claim to fame being the first resort of its type to open in Europe. I stayed in Arc 1800 picked for its location close to the Vanoise Express which is a huge 200 person cable car connecting Les Arc and La Plagne, in fact it’s one of the longest and fastest cable cars in the world! Built back in 1975 Arc 1800 is not only the largest resort but also the liveliest with lots of bars and restaurants, my favourite being ‘Barking Mad’ with its comfy outdoor seating and views out over the mountains with a pint of beer costing €5, the perfect location for a spot of après ski. Blue bird sky! 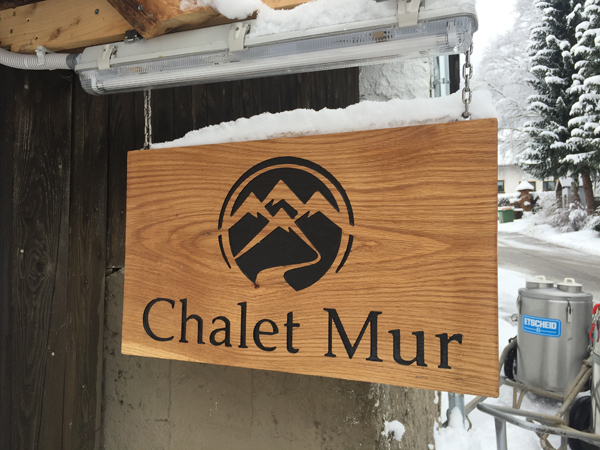 Comfy outdoor seating and views out over the mountains with a pint of beer costing €5, the perfect location for a spot of après ski. We stayed at L’Alliet in a self catered apartment located in the Charmettoger region of the town. This apartment is a little gem recently renovated in 2015 in true alpine style, what we loved was the flexibility of either cooking some homely food or dining out at the various restaurants found a short 5-10 minute walk away. 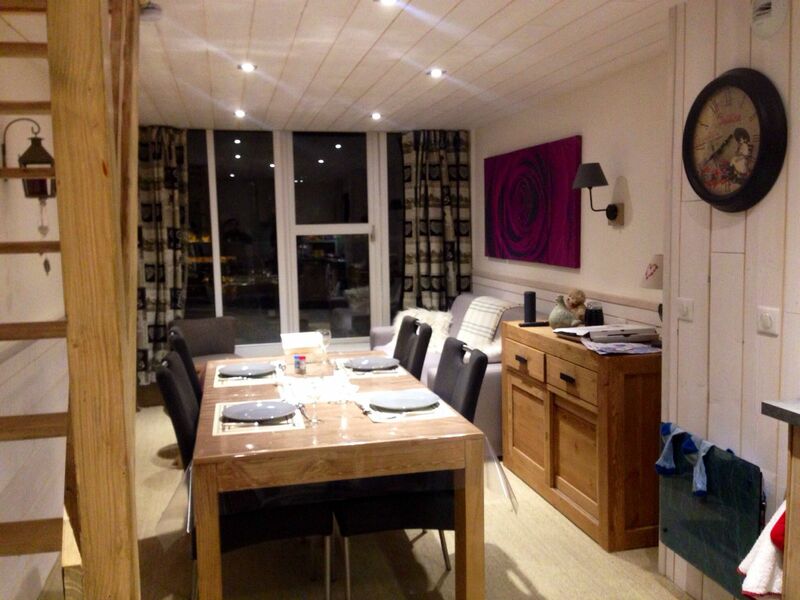 L’Alliet in a self catered apartment located in the Charmettoger region of the town. In all there are five lifts out of Arc 1800 but by the best and easiest is the Transarc 1 which connects to the Transarc 2 at the mid station. Once at the top you have excellent access to a huge variety of newly groomed runs (if like us you got the first lifts up). The snow conditions were good throughout the week although some started to become icy leading back down to town at the end of the day, all in all the conditions were good despite the slow start to the season. And best of all we had blue bird days most of the time we were there, what more could you ask for! One of my favourite runs would have to be the Grands Melezes which starts at the top of the Vagere chairlift, the run is both long and wide with the conditions being perfect allowing me to perform some large sweeping carving turns. 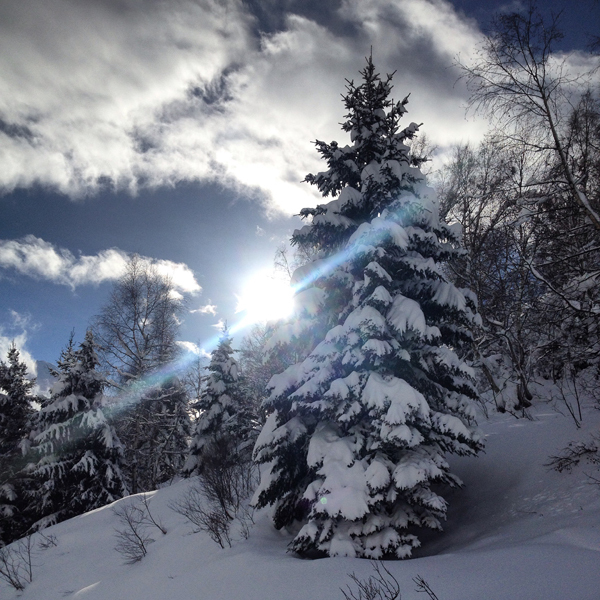 An adult lift pass to the whole Paradiski area is €291 (about £222) or the Les Arc local area is €250 (about £190). B-e-a-utiful; but respect the mountains. Warning! Danger avalanches! Overall this resort and ski area is one of my favourite with its mix of glacial high altitude runs and the option to ski through the trees lower down during poor snowy conditions. 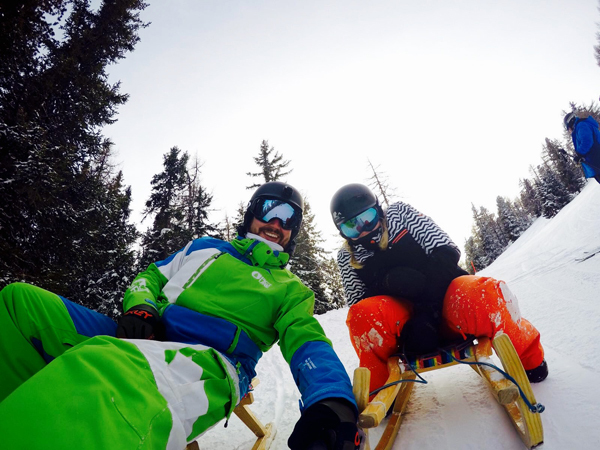 So what does a quinquagenarian, recreational skier think of the Volkl Kendo skis? 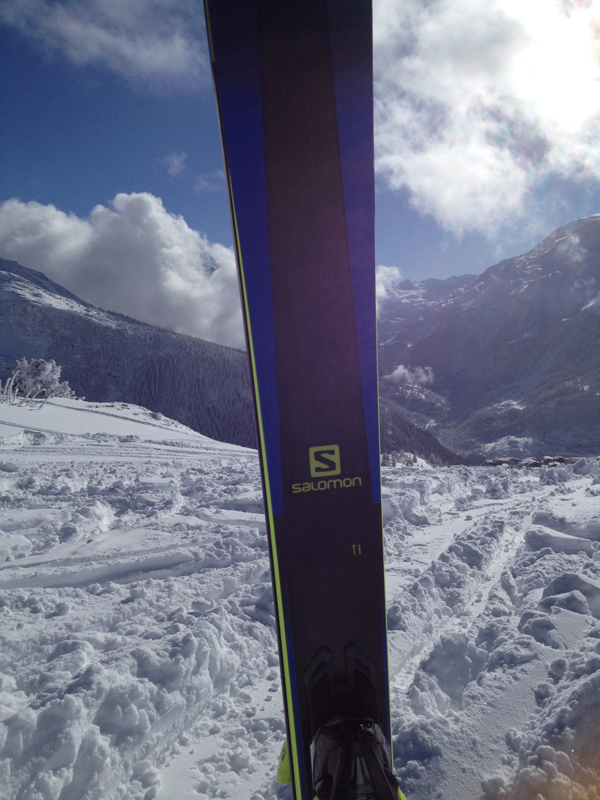 Volkl kindly provided a pair for me to review on my annual ski holiday to La Rosierre, France. I taught myself to ski at the Lecht, Scotland in the 80s and had a few lessons, in Austria, while the children were in ski school (the only way to convince them to go was to say we were all having lessons)! I go skiing once a year, and look forward to six days of fun sliding down a mountain. I’d class myself as an intermediate to advanced skier, but fully aware that purist would pull my technique to pieces. I’m happy that I can control my skiing, at speed (which means I think it’s fast, but my sons tell me otherwise), down red and some black runs! Historically I would hire what are considered piste or all-mountain skis. And when I say all mountain, they are 80% piste 20% off piste. 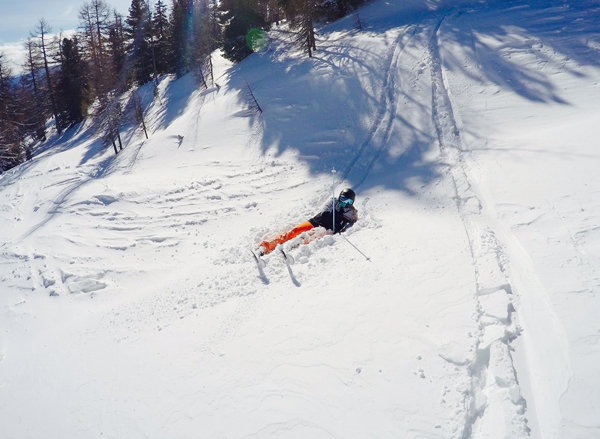 Fortunately most holidays have been groomed pistes (corduroy), until last year when knee-deep powder on the piste took a little fun out of the sliding down a mountain! I wasn’t very good in knee-deep powder; was it me or was it the skis. 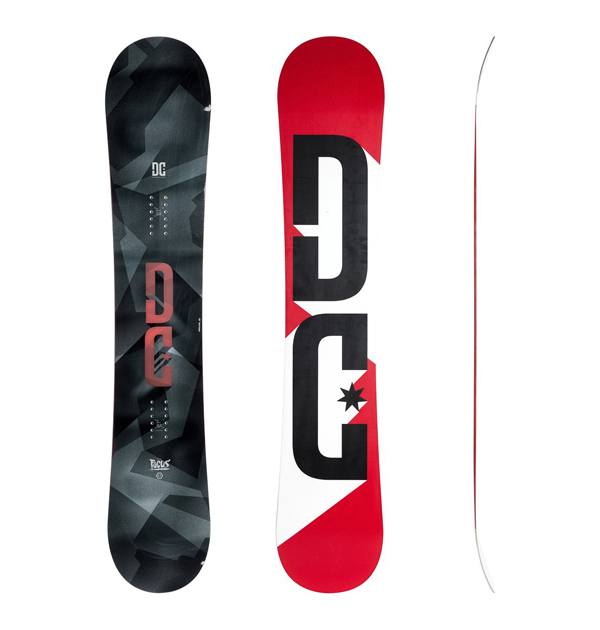 Whatever it made me think; I go skiing for six days a year, what type of skis should I buy? Piste or something suitable for powder? If money was no object, I’d have one of each. So when I explained my dilemma to the guys in the Pro Shop, they suggested I try an all-mountain ski that was more off-piste focused such as the Volkl Kendo skis. The Kendo skis are a 50-50% piste off-piste ski, for an advanced to expert skier, so may be ‘punching above my weight’ with these skis! The first thing I noticed was how much wider the skis felt, the waist was in fact 10mm wider at 90mm compared to my old skis. The ski also had a much larger rocker at the tip which helps push the ski up on to the powder rather than slicing through it. And the bindings were drilled onto the ski, rather than the usual rail system I was familiar with. So it was in at the deep end (literary) because there had been plenty of snow in the resort! I would have like a few groomed pistes to find my ski legs, but that wasn’t an option, so the first morning wasn’t great. However after a stern talking to myself, and a few pointers from my son, the afternoon was better; and I began to embraces the conditions and what the Kendo skis offered! During my week’s skiing we had over a metre of snow, and poor visibility, so not quite the conditions I had hoped for, but never-the-less ideal conditions to test the skis. So what did I think? A bit like the skis 50-50. 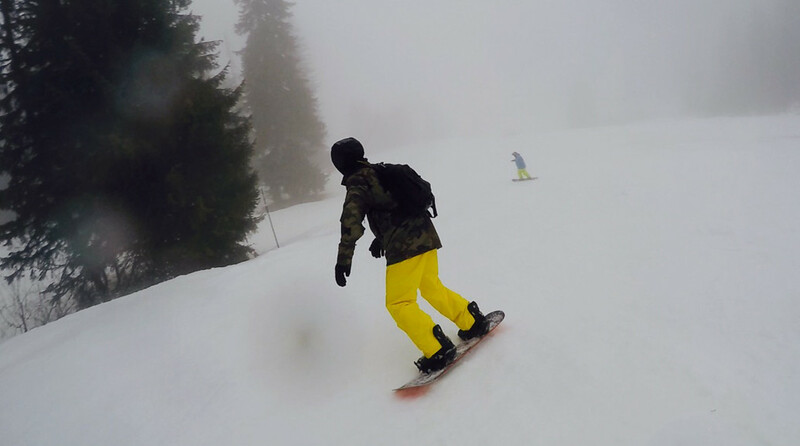 The skis were a lot stiffer than I am use too, because they are designed for someone of a higher ability, and turn radius was bigger than previous skis at 20.8m; so I found myself having to work extremely hard down the slope. The poor visibility didn’t help! I also struggled a little on the ice, but that may be more down to technique and not fully engaging with the ski. However, what I did find, is that the skis floated through the powder, which had hampered me before. When the visibility improved, it was a different story. With greater confidence I carved with gusto down the piste. 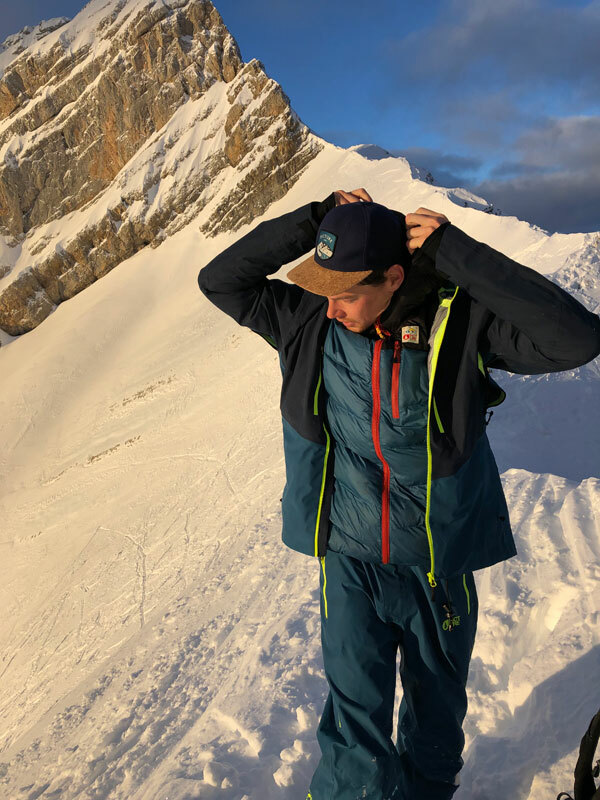 The skis just ploughed through the powdery ‘crud’, that had built up from other skiers, thanks to the ‘rocker’; and the large turning radius no longer hindered my progress, as I zig-zagged down the slope. I had fun! I now understand where the guys in the Pro Shop were coming from; a ski for all conditions because the weather and snow conditions cannot be guaranteed for the six days I am in resort. And these Kendos certainly ‘cut-the-mustard’. I think I had ‘bitten-off-more-than-I-can-chew’ with the Kendos, though, but I certainly like that style of ski. Perhaps a similar all-mountain ski that is more suitable for my ability, such as the Line SuperNatural skis would be my choice. And this is an important point to note when buying skis – be honest! When the visibility improved, it was a different story. With greater confidence I carved with gusto down the piste.